Our company is involved in the trade of 13 Face Rudraksha that represents Lord Indra and Lord Kamdev. 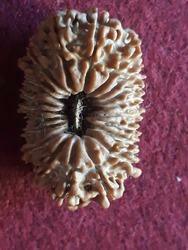 The ruling planet of this rudraksha is Venus and it is widely popular among our customers for its effective results. The offered rudraksha beads are quite beneficial in offering spiritual upliftment and worldly comforts to the wearer and for those who are looking for love. 13 Mukhi Rudraksha improves the flow of money by any means,business, job,share market,very beneficial for the business person and marketing professionals. In fact, 13 Mukhi is the only Rudraksha after 16 Mukhi which is responsible for immediate money flow. 13 Mukhi also improves prospects of marriage and affairs. 14 Mukhi Rudraksha is the true form lord hanuman and him who were 14 much rudrakshas or performs puja of fourteen Mukhi rudraksha attains moksha. Its ruling planet is Saturn. Fourteen Mukhi rudraksha helps in opening the third eye chakra which governs clairvoyance, sharpened skills, heightened state of awareness etc. This rudraksha (rudraksha) symbolizes lord Shiva and lord hanuman. This is helpful in many diseases. It is helpful in controlling heart diseases, high blood pressure, diabetes, skin diseases, and problems. This enhances all the pleasures of life. The wearer of this rudraksha is honored by god even. 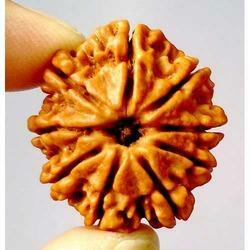 Fourteen Mukhi rudraksha is best for appeasing the negative effects of planet Saturn. Especially during saddest. Those who are suffering problems with regard to job, profession, marriage or exam because of ill effects of Saturn or maha Dasa of Saturn in horoscope shall definitely wear it or keep it with them. You will see new dimensions in your life and all problems would be solved. 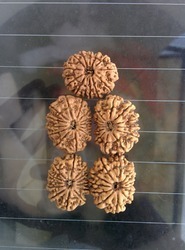 14 Mukhi Rudraksha shown in pic is available and can be provided. 11 Mukhi Rudraksha offered by us is well regarded as a light mass of lord Rudra shiva (eleven rural) and is the most effective rudraksha for devotees of lord shiva. There are eleven rural and the eleventh Rudra is lord hanuman known for his virtues, cleverness, learning and wisdom. It helps wearer in becoming strong, wise, healthy and lead life without any diseases. Further, it also helps in relieving wearer from fear of sudden death and gives courage and confidence to a wearer to lead an adventurous life. Further, it is also helpful in meditation. 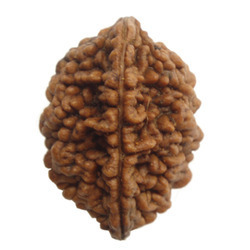 We are counted as the reputed supplier and exporter of optimum quality 10 Face Rudraksha. Helping the wearer to overcome difficult times, it has fetched high demands in the market. Protecting the wearer from the influence of and evil spirits, the offered product further creates a feeling of security. In addition to this, it aids in meditation and devotion. We are one of the prominent manufacturers and traders of 21 Mukhi Nepali Rudraksha that represents Lord Kuber. The proposed rudraksha bead is helpful in giving protection against mantra and tantra and empowers the wearer with prosperity, materialistic desire and super powers. 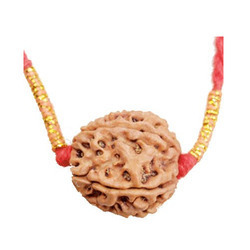 These effective rudrakshas are popular as they provide protection from enemies as well. 12 Face Rudraksha is the center of brilliancy, luster, radiance and strength as it symbolizes 12 forms of god the sun (Surya). The wearer gets the quality of Surya to move continuously and shine with brilliant radiance and strength. This rudraksha also helps in providing knowledge as well as riches along with all earthly pleasures. 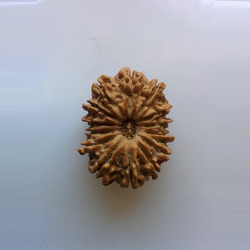 Being miraculously effective, this rudraksha is also most useful for administrators, politicians, businessmen as well as for aspirants of name and fame. Benefits: It makes a person fearless and trouble free it provides quality of leadership control over people it removes all types of tension and makes wearer radiant like the sun. It provides wearer inner strength and makes a person happy within. Recommended for Curing diseases of eyes, Mental disorders, Bone diseases, Indigestion, Blood pressure, Diabetes and problems of the intestine, Diseases of heart, Rickets, and osteoporosis. 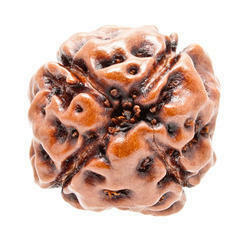 The 1 Mukhi Rudraksha is on of the most auspicious rudraksha bead as it bestows wealth and happiness. The wearer of one Mukhi rudraksha gets bhakti, much and peace. It is believed that wearer of Ek Mukhi rudraksha would get rid of the sin of Abraham Katya and would get salvation. Sun or Surya the center of the Solar system around which all the planets revolve represents one much. It controls the malefic effects of Sun and cures diseases of the right eye, head, ear, bowel, and bones.The confidence, charisma, leadership qualities and prosperity of the person increase as Sun is pleased with the wearer of Ek Mukhi Rudraksha. The most sought after Rudraksha. These are extremely rare and are one of the most costly Rudraksha beads. An Ek Mukhi Rudraksha (Rudraksha) can bring you immense power, wealth, luxuries, fame, massive confidence boost and spiritual enrichment. This bead often carries an auspicious sign of signifying a connection with Lord Shiva. One much rudraksha is considered as the best among all other Rudraksha beads. This is the mother of all other forms of Rudraksha.This gives all worldly pleasures and then helps one attain perfection in after life.It is said that where one faced Rudraksha is worshiped, that place is always full of riches and goddess Lakshmi has special grace on such places. This is the symbol of lord Rudra. It bestows all prosperity on the wearer.Such a Rudraksh (Rudraksha) is obtained by the grace of Lord Rudra only. Mystic Rudraksha is the preferred name among our customers that offers 2 Face Rudraksha, which signifies half Lord Shiva and half Goddess Parvati. The offered two faced rudraksha bead brings emotional harmony in relationships and effectively controls the harmful effects of Moon. 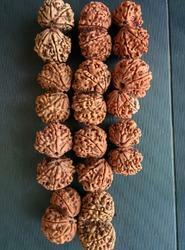 These DWI much rudrakshas provide great help in controlling lack of concentration, frustrations, and anger. 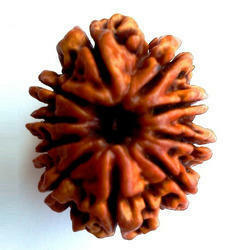 3 Mukhi Rudraksha signifying Mangal and used to appease Mangal Dosha in the horoscope. 3 Mukhi rudraksha ruling planet is Mars, malefic effects are a disease of the blood, blood pressure, weakness, disturbed menstrual cycle, kidney etc.. Depression, negative and guilty feelings, inferiority complexes can be lessened by wearing this much. 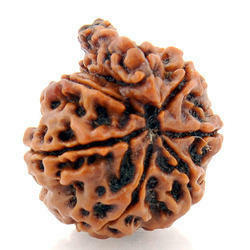 The three Mukhi Rudraksh (Rudraksha) is worn to boost the self-confidence and to counter depression. 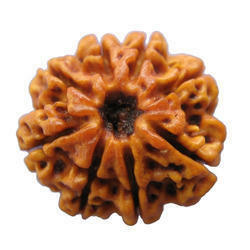 Three much rudraksha also provides physical strengths and helps in cure of several diseases. It also wards off ill-luck and tensions and can help purify all sins. 4 Face Rudraksha bead represents goddess Saraswati. The ruling planet is mercury, also representing Brahma. Malefic effects of mercury include intellectual dullness, lack of grasping and understanding power, difficulty in effective communication and also neurotic conditions of the mind. Four Mukhi nullifies the medicine effects of planet mercury and pleases goddess Saraswati. It also governs logical and structural thinking. This bead helps achieve a healthy mind and body. It can help increase mental power, intelligence, concentration, and knowledge. 4 Mukhi rudraksha also symbolizes lord Brahma. If the rudraksha is boiled in milk and that milk is taken for 20 days. It gives knowledge and clarity of mind, it is said by wearing it, the ill evil thoughts arising in one's mind are destroyed. 4 faced rudraksha is especially important for the students and scholars. All types of learning become easier to the wearer of this 4 Mukhi rudraksha. Such a person gains deep insight and perceives the secrets of religion easily. Lord Rudra is very much pleased by the wearer of this rudraksha. Our company is engaged in the trade of 5 Face Rudraksha that represents Lord Shiva. These rudraksha are extremely beneficial in achieving eternal happiness and peace and is widely used to destroy the malefic effects of Jupiter such as poverty, lack of harmony and peace. People suffering from high blood pressure get intense relief by wearing this rudraksha. We are engaged in the business of supplying and exporting of best quality 6 Face Rudraksha. It helps the wearer attain success and wealth as well. Beneficial in curing epilepsy, the offered product is highly regarded among the clients, we have. In addition to this, the range of 6 face rudraksha offered by us is highly popular for reducing the diseases caused by malefic venus. It helps students and businessmen. We specialize in the supplying and exporting of premium quality 7 Face Rudraksha. This avatar representing instrument symbolizes seven great rishis. The offered product helps in attaining prosperity and peace of mind. Known for providing wealth and spiritual knowledge, the entire range of 7 face rudraksha offered by us is widely praised among our customers. Shiva has special grace on its wearer and thus the person is not affected by sins and he attains all merits befitting goals. The ruling god of 8 Mukhi Rudraksha is lord Ganesha and the ruling planet is Rahu. The eight living on it makes it very effective. Its wearer becomes unaffected by miseries-physical,divine or mental. It sets the wearer free from the sin of telling a lie. It gives the wearer rides and siddhis. The minds of the enemies or opponents are changed and all obstacle from the path are removed. Wearing 8 much removes the malefic effect of planet Ketu. We are one of the leading names to provide 9 Face Rudraksha with nine much as or natural lines on the surface. The offered product removes the destructive effect of Kal Sarp Yog and Ketu, thus providing moksha and worldly pleasure. The ruling God of this rudraksha is Goddess Maha Durga and it proves to be extremely beneficial for the well-being of women. Gaurishankar Rudraksha made available by us falls in the rare category of rudraksha bead and is beneficial especially in maintaining good relationships between husband and wife. Further, it is also extremely beneficial for people who want to get married but are not getting right life partner to begin their life with.